DNA – Where to Test? This is a subject that has been whipped, but good. There isn’t a lot to add to the information about where to DNA test, but since some of my readership may be looking only to me for this very advice (delusions of grandeur), I have to whip it one more time. If you have already been around the block on this, you can sit back with a nice piece of hot blueberry pie while I ramble on, entertainingly, about where to test. The rest get your pie at the end. Prices range from around $99.00 US to about $249.00 US for single tests. If you don’t live in the US and your currency isn’t doing well against the US dollar, prepare for even more sticker shock and high fees for shipping. You can get an Autsomal Test and/or a y-DNA test or mtDNA test and you can order a test: from 23andMe, Ancestry, FamilyTreeDNA, My Heritage and National Geographic. The companies vary in the tests they offer so you should spend time looking over the FAQ for each company to decide which one is right for you, based on what you want to know and what test you need to point you in the right direction. A previous blog post gives some advice on the, “what you want to know” and the “what tests” for you here: DNA- Who to Test? No. You will want to read to make sure testing is available for your area. For example, Ancestry DNA testing is only “available in the United States and for purchase online for residents of the United Kingdom, Ireland, Australia, New Zealand and Canada.”- Ancestry FAQ #10. Now that that is done, everyone enjoy the hot from the oven blueberry pie I just served you! Some Vanilla Ice cream too! Also see Why DNA? 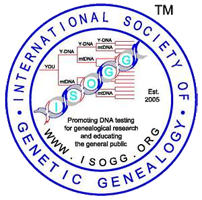 to see why you would want to do DNA testing.